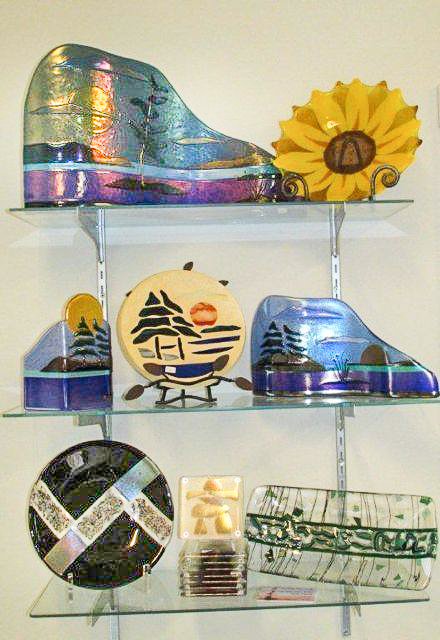 For over twenty five years artist Linda Bennett has been passionate about glass. A desire to learn and explore the ever changing medium has led her to combine techniques like painting, etching and fusing with traditional lead and foil work. Recently her focus has been primarily fused glass and the endless possibilites of combining powders , frit and sheet glass to create pictoral and functional pieces. The collection of landscape sculpture of Georgian Bay and the Canadian Rockies reflects the natural beauty that inspires her. Architectural commissions grace many homes and businesses, while a large part of her fused sculptural work is used for corporate gifts and awards. Her work can alsobe found at Mountain Galleries at The Fairmont inJasper, Banff and Whistler, as well as OMAHin Orillia and Quest Art in Midland. Linda works from her home studio in Tiny near the shores of Georgian Bay.